I hadn’t taken a shower and I was dressed like a toddler in mismatched hot pink pajama pants and old ratty Seattle Mariners t-shirt. Lola the Dog started barking at the front door. I assumed a package had been delivered but I didn’t see one through the narrow window by the front door. I peered through the window and to my shock, saw a man dressed in camouflage facing my front door. A baby was strapped onto his chest in a Baby Bjorn. I could not even process this. A shaggy, camouflaged man? With a baby on his chest? I know better than to open my front door to a stranger, but this was a baby-wearing stranger, so I grabbed onto my barking dog and opened the door a little. The man yelled, “I want my wagon back!” He could not have said anything weirder. I don’t know if I just blinked or said, “what?” But in spurts, he shouted the story to me. Here is the summary of the story he told. 1) He left his red wagon on the sidewalk down the street right outside the trail. 2) While he was on the trail, a man and woman in a red car drove by. They seemed to be arguing. The woman got out and grabbed the red wagon and put it in their red car. 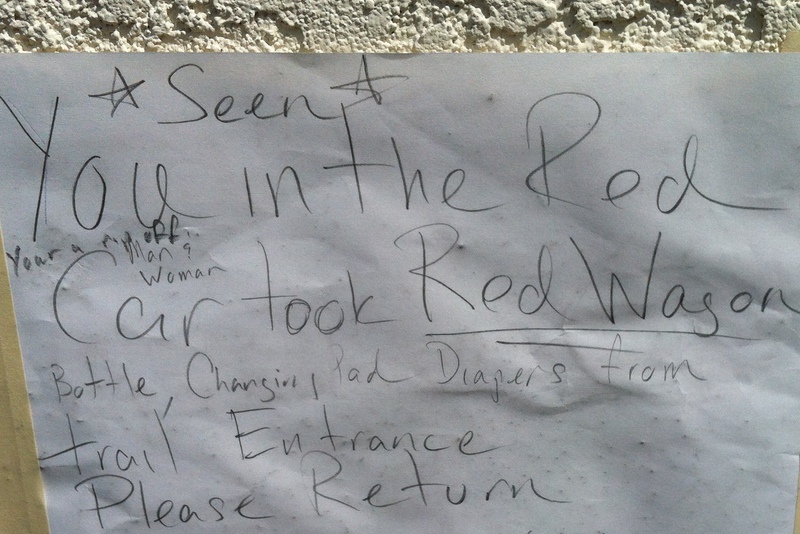 3) Someone saw this happen, so they went up through the neighborhood to track the red car. They determined that the red car was parked in my driveway and therefore, that I was guilty of theft. 4) When the camouflaged, baby-wearing guy emerged from the trail, the eyewitnesses described the crime and told him my house number and so he marched up the street to demand that I return his stolen red wagon. The miracle of all is that this scary, yelling guy eventually believed me and walked backwards from my door, reluctantly accepting my insistence that I didn’t have his wagon. After he left, I locked my front door. Honestly, I was a little scared he’d come back with a crowbar or blow-torch or a baseball bat with which he’d break my kneecaps. I have never been so grateful to have a very loud, big dog. I hope that guy finds his wagon. And I hope those eyewitnesses get some new glasses. wow…that was weird. happy to know you are okay! SCAREY! One never knows what a person is capable of doing – and infants and small children can be unknowingly used to gain access. Good thing YOU opened the door (not really) rather than, say, your young daughter! I’m so sorry for that weird encounter! !